The following is a guest post from Trish Thorpe, Author of "Fisheye: A Memoir" and "Asperger's Sibling Support: 15 Practical Tips for Parents/Caregivers". Please take a moment to check out Trish's books. Autism Spectrum Siblings Need Love and Guidance Too! I'm 53 and the younger sister of an older brother (by two years) who had undiagnosed Asperger's while we were growing up (1960s and 1970s). My brother and I grew up with very unaware, self-involved parents. Short story...I spent years in therapy sorting through our family dynamics and learned so much about the kind of parental support needed to raise special needs kids and neurotypical siblings in a balanced home. I'd like to share what I learned. I collaborated with my therapist and wrote a series of tips that will hopefully help parents and caregivers understand and support ASD siblings. My goal is to raise awareness of the need for Autism Spectrum Disorder (ASD) sibling support (the often-overlooked piece of the ASD support puzzle). By admitting this, you’ll be offering a more realistic view of yourself as someone who is coping and learning on a day-to-day basis. You’ll also be conveying that you are not a superhero whose achievements are unattainable for the average person. This will hopefully open the door for your Asperger’s sibling to feel like they can make a positive contribution. You probably find yourself constantly explaining why the rules and expectations are different for different members of your household. For example, maybe your Asperger’s child gets to spend extra time on the computer and/or less time doing homework. Explain to your Asperger’s sibling why it’s happening. Explain that their brother/sister does homework with a special teacher at school and therefore doesn’t have as much to do at home. This will hopefully dispel any claims of unfair treatment. If not, continue explaining that extra time on the computer might help their brother/sister develop skills needed to live as independently as possible, which could benefit the whole family. If you explain it as being an advantage for the entire family, that may allay any claims of favoritism. It will also help your Asperger’s sibling feel like you’re entrusting them with special information. Create an environment of compassion for differences in others. Try to model a positive perspective by always pointing out the constructive traits of having Asperger’s Syndrome (enthusiastic, conscientious, free of prejudice, honest) instead of dwelling on the negative. Here’s a link to fifty positive Asperger’s traits. Children mimic their parents. The way that you view and project the attributes of your Asperger’s child can be an example of strength and resiliency for your family members. They will follow your lead. Remember that your Asperger’s sibling will have to deal with many different people, personalities, and temperaments as they navigate their way through life. Learning compassion from your love and guidance will benefit them greatly. Your Asperger’s sibling needs to feel entitled to their own belongings and their own private place in the world. This will hopefully reinforce the notion that they are a complete person separate from their role as an Asperger’s sibling. Find a spot in your home that they can call their own. It doesn’t have to be big. It can even be as simple as a shelf or a drawer. Just something that is solely theirs. Make sure that both siblings understand the boundaries. Watch for hints that your Asperger’s sibling is blaming themselves for their sibling’s Asperger’s. If you suspect there is any doubt in their mind about the cause of Asperger’s, reiterate that it’s simply something people are born with and that it’s nobody’s fault. You can say this as a general statement; it doesn’t have to be in reaction to something else. Just say it out loud, more than once, and it will sink in eventually. I hope these tips are helpful. There are more. They come from the heart. Would love feedback about whether or not they make sense for everyone. 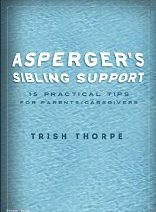 Trish Thorpe, “Asperger's Sibling Support: 15 Practical Tips for Parents/Caregivers” is available from Amazon. Enjoyed the guest post. My family dynamics were similar in the 70s & 80s. I have two older brothers with possible Asperger's, 1 now in the process of being diagnosed, as well as a younger sister. All 4 of us were born within a 6 year time span. My mother was overwhelmed, and my father worked most of the time. Now I have 2 elementary aged children, a diagnosed son and younger NT daughter. I know these tips will definitely help us to maintain a healthier family dynamic. Thanks!